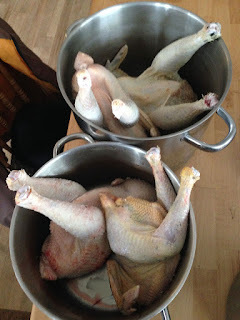 Farmers occasionally have old hens, or extra roosters and we were usually told that the only thing you can do with the stringy old birds is to make broth. We like to make them into the most delicious sausage. We were recently gifted with three roosters, and having an extra rooster of our own, we were able to create 8 pounds of sausage of two kinds this afternoon. You could also make these recipes from turkey or duck. Use both dark and light meat plus the skin for fat. Be sure to keep everything super clean, and cold. Whenever you are not actually handling the chicken, it should be on ice or in the fridge. Wash everything in the dishwasher or with hot soapy water. Mix the chicken meat & sage leaves and put through the grinder with medium course grind disk. Mix in the maple syrup and seasonings. Put through the grinder a second time with finer grind disk. Let rest overnight covered in the fridge before cooking and it tastes even better! Either form in to patties or links and freeze whatever you won't be cooking in the next couple days. Hi- we're trying your breakfast sausage recipe with some almost 4 month old roosters. We had a particularly large hatch this year more than half of which were roos!!! Wondered if I could supplement lard I've rendered from our pigs as an added fat source for the meat?